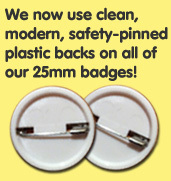 We make badges in three sizes, small 25mm badges, medium 38mm badges and large 55mm badges. 25mm badges are the most common size of badges you'll find. 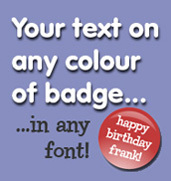 38mm and 55mm badges on the other hand are the larger kind that you'd find on the front of a birthday card. 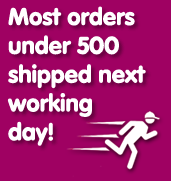 You can either use our online quote facility or select the badge size below to look at prices and buy.